I’d like to bring your attention to a really, really good interview with Brad Schreiber, author of “Revolution’s End: The Patty Hearst Kidnapping, Mind Control, and the Secret History of Donald DeFreeze and the SLA”. Schreiber makes it clear in this interview that the emphasis in the book is more about kidnapper and government patsy Donald DeFreeze, and the mind control program at Vacaville Prison that turned him into an agent who was sent out to destroy the Black Panthers and similar radical movements. 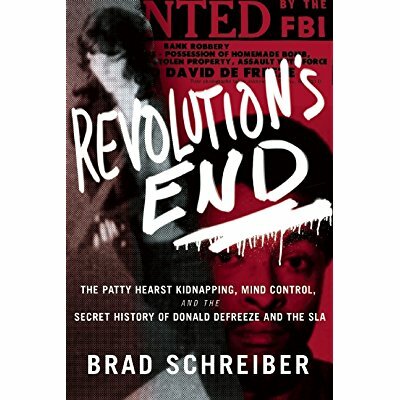 The subtitle of “Revolutions End” is “The Patty Hearst Kidnapping, Mind Control, And The Secret History Of Donald DeFreeze And The SLA”. The Symbionese Liberation Army, controlled by “Cinque’” (Donald DeFreeze), was wholly a creation of a mind control operation run by authorities at Vacaville Prison in California. Embedded within the “Black Cultural Association” (BCA) at Vacaville was a plan to destroy emerging radical and revolutionary movements. The program was run by Colston Westbrook, a black Vietnam vet that worked for the CIA. Westbrook’s mark was Donald Defreeze, a failed crook who became an informer for authorities to obtain soft-time and privileges within Vacaville. This entry was posted on March 18, 2018 at 5:25 pm and is filed under Book review. You can follow any responses to this entry through the RSS 2.0 feed.